Coronary arteries are the greatly enlarged vasa vasora, which supply blood to the heart in the form of ring and sling. The right and the left coronary arteries arise from the aortic sinus of valsalva at the root of the aorta and encircle the base of ventricles like a crown. Variations of coronary arteries can be fatal. It can lead to sudden death during strenuous activity. A cadaveric study in unsuspected population can help understand the variations that will be useful to determine the prevalence of certain variations. 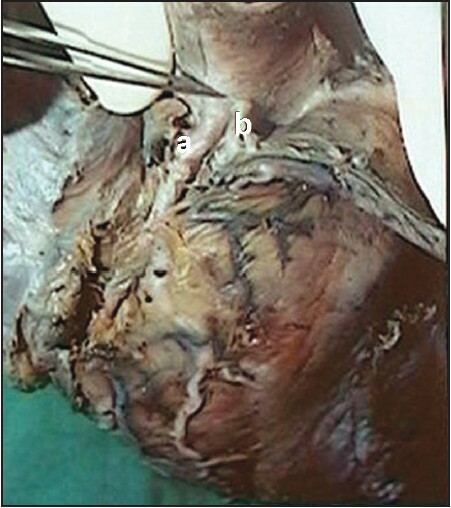 A detailed dissection of coronary arteries in 60 cadaver hearts fixed in 10% formalin was carried out in the Department of Anatomy. 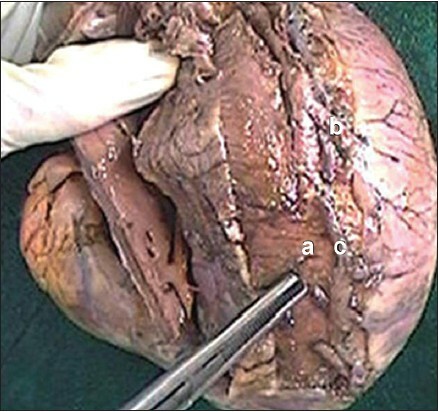 The coronary arteries and their branches were dissected in the atrioventricular and interventricular grooves on the surface of heart. Origin, branching pattern, dominance, length, myocardial bridging, and looping of the arteries was studied. The length of the arteries was measured with the help of thread and millimeter scale. In all 60 cases, the dissected right coronary artery (RCA) was found to arise from the anterior aortic sinus [Table 1]a. In 65% of cases, where the range of length of RCA was around 8-14 cm, the artery was dominant, i.e., the posterior descending (PD) branch and branch to AV node was found to be a branch of RCA [Figure 1] [Table 3]. The branch to SA node in all the cases was found to be a branch from RCA [Figure 2] [Table 1]b. The conus was found to arise from RCA in 92% of cases [Figure 2] and [Figure 3]. However, in 8% of cases, the conus had an independent origin from the anterior aortic sinus [Figure 4] [Table 1]a. The acute marginal branch arose from the RCA at the right border of heart. The range of length of this branch was found to be 3-4.5 cm in 23%, 4.5-7 cm in 66.7%, and 7-10 cm in 10% of cases [Table 3]. PD artery and artery to AVN was found to be a branch of RCA in 90% and branch of circumflex in 10% of cases. In 60% of cases, the length of PD artery was found to be in the range of 5-7.5 cm [Table 4]. In all 60 cases, the dissected left coronary artery (LCA) was found to originate from the left posterior aortic sinus of the ascending aorta. The average length of LCA was found to be 7 mm, after which, it bifurcated or trifurcated [Tables 1] a, 1b, [Table 2] In 16.6% of cases, the LCA trifurcated into left anterior descending (LAD), circumflex (CX), and ramus intermedius (RI) branch [Figure 5], while, in 83.3% of cases, it bifurcated into LAD and CX branch. In all 60 cases, the LAD and CX were found to be the branches of LCA. The length of CX was found to be 3-5 cm in 20%, 5-9 cm in 70%, and 9-11 cm in 10% of all cases. In these, 10% of cases with the maximum length of the circumflex coronary artery was found to be dominant, i.e., the PD and branch to AVN were found to be the branches of CX coronary artery. The length of LAD was seen to be 4-7 cm in 3%, 7-10 cm in 16.6%, 11-14 cm in 66.6%, and 14-17 cm in 13.33% of all cases. In the range of length from 10 cm to 17 cm, the LAD was found to turn around the apex of the heart and anastomose with PD branch. Along its length, the LAD gave rise to 2-3 diagonal branches on its left side. The obtuse marginal artery was found to be a branch of circumflex coronary artery in all 60 cases. However, in 10 cases where the LCA trifurcated, the OM was replaced by the RI branch of LCA [Figure 5] [Table 2]. 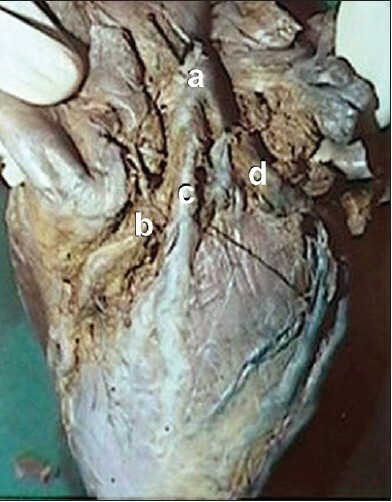 Figure 6: (a) Myocardial bridging over the left anterior interventricular artery, (b and c) Diagonal branches. The RCA, after arising from the anterior aortic sinus, usually gives the following branches: Branch to SA node, conus, acute marginal, PD, and branch to AV node. PD branch gives septal branches to the posterior 1/3 rd of interventricular septum. The LCA usually bifurcates into LAD and circumflex coronary artery. The LAD gives septal branches to the anterior 2/3 rd of interventricular septum. It also gives 2-3 diagonal branches on the sternocostal surface. The circumflex coronary artery gives obtuse marginal branch and ends at the crux of the heart by giving PD branch and branch to AV node. The PD and branch to AV node decides the dominance of coronary arteries. If it is a branch of the right coronary, it is called as right-dominant circulation. If it is a branch of CX, then it is said to be left-dominant circulation. Codominance may also exist. Usually, the coronaries lie on the myocardial surface. Occasionally, the myocardium may cover a segment of branches of coronary arteries; these are called as myocardial bridges. When the coronary arteries run in an atriventricular groove, the atrial musculature may loop around the arteries; these are called as myocardial loops. However, the coronary arteries showed a considerable variation in the branching pattern, length, and myocardial bridging. According to Loukas et al., (2009),  it is desirable to determine the incidence of variations that are potentially capable of producing sudden cardiac death. In the present study, the prevalence of independent origin of the right conus from the anterior aortic sinus was 8%, wherein it showed the presence of an accessory ostium in the anterior aortic sinus. This ostium was relatively smaller in size and was situated higher to that for the RCA. In 1967, Baroldi and Scomazzoni  described the prevalence of independent origin of right conus to be about 36%. Similar findings were noted by Bhimalli et al.,. Since the accessory ostium is very small, it may fail to get opacified during angiographic procedures. In all 60 cases, the RCA arose from the anterior aortic sinus. However, RCA may have ectopic origin from the LPAS. The prevalence of this ectopic origin was observed to be 0.0008% on angiographic studies, as mentioned by Yarnanaka and Hobbs  and 0.043-0.46%, as studied by Solanki et al. Simkoff (1982)  reported a case of anomalous origin of RCA from the LAD. Multiple attempts to cannulate this artery were unsuccessful and an aortic flush injection confirmed its absence. In the present study, the branch to SA node was seen to arise from the RCA in all 60 cases. However, in 1978, Hutchison  described a variable origin of the branch to SA node from circumflex coronary artery in 35% of cases, which is a significant fact. In 1961, James  described the course of main LCA, wherein he stated that the branch to SA node may arise from the LCA. Kini et al.,  found that the branch to SA node arose as the branch of RCA in 55% of cases on computed tomography (CT) angiograms. In the present study, in 90% of the cases, the RCA was dominant, i.e., the branch to AV node and PD branch is a branch of RCA in 90% of the cases. A dominant right coronary terminates beyond the crux by giving 2-3 posterior lateral ventricular branches. In 60% of the hearts, the RCA reaches the crux and terminates a little to the left of crux in a variable degree of anastomosis with the circumflex branch of the LCA. 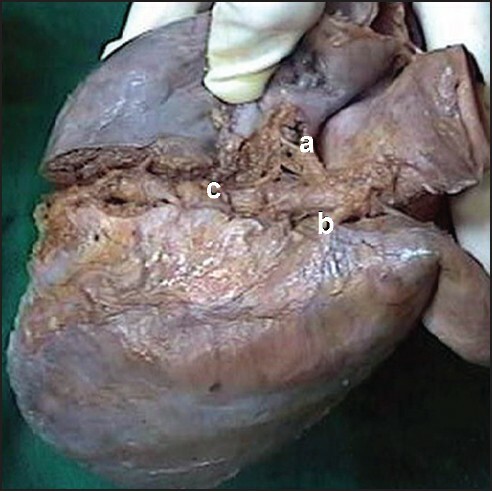 In 10% of the cases, it ends near the right cardiac margin or between this and the crux and, in 20% of the cases, it may even reach the left border of the heart, replacing the terminal part of circumflex. The range of length was 8-14 cm in 65% of cases, where the artery was dominant. In the present study, the branch to SA node arose as a branch from RCA in 100% of cases. However, it may arise from circumflex, usually from its anterior part traversing the interatrial septum to supply the SA node, thus establishing a direct or indirect anastomosis with the RCA, as mentioned by Kugel in 1927. The appearance of the left conus was not a constant feature; it was seen in 3 out of 60 cases, originating either from LCA or LAD. Variation in the origin of coronary arteries and their branching pattern can pose difficulties in imaging by conventional catheters, thereby creating problems in diagnostic and therapeutic interventions. In the present study, the overall prevalence of myocardial bridging and looping was found to be 88% on cadaver dissection. It was found to be more common in the left coronary system (60%) than in the right coronary system (23.8%). In the left coronary system, the myocardial bridging was frequently seen in the LAD artery (43%). In the LAD artery, it was more commonly found in the middle 1/3 rd portion of the artery. 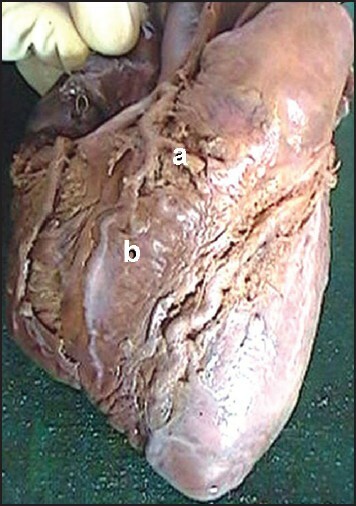 A variation was encountered by the occurrence of myocardial bridging over the proximal and distal segments. This finding concurs with the findings reported by Sabnis. Along its course in the right atrioventricular groove in 6.7% of the cases, RCA showed myocardial looping, which is an anatomic variation. The frequency of myocardial bridging in left anterior interventricular was 23% according to Geringer  and 85.7% according to Polaeck,  based on cadaveric dissection. The myocardial bridges over the branches of RCA are rare as they are found in 2.8 to 11.4% of cases. Muscular loops occur more frequently in the course of circumflex as compared to that in RCA. There is a paucity of references regarding myocardial loops in the literature. The overall incidence of myocardial bridging in LCA was found to be 77.1%, while it was found to be 41.4% in RCA in a study by Poelack. Kramer  in 1982 stated that myocardial bridges that are present right from the period of development are not the source of myocardial ischemia. The frequency of detection of bridging in angiographic films is 0.5-12%. It is seen as a systolic narrowing of arteries in a coronary angiogram. The findings of myocardial bridging in the present study concurs with that of Bandopadyay  et al., and Vanildo,  who found it to be 90.40% and 86.6%, respectively. However, it was 65.7% in a study by Sabnis  and 55.60% in a study by Ferreira. These values are less as compared to that found in the present study. Myocardial bridge may cause myocardial ischemia. It may require surgical repair and supra arterial decompression myotomy. Localization and progression of stenotic lesions of coronary arteries can be influenced by anatomical characters of coronary arteries. Study of myocardial bridges requires further in-depth analyses. Most of the variations are totally benign; some are errors of embryological developmental timing or persistence of an embryologic condition. Coronary artery variations are important from clinical and surgical point of view. The study of coronary artery variation is important to prevent false interpretation of the coronary artery angiograms and to study and manage diseases related to coronary arteries. Department of Anatomy, Seth GS Medical College, KEM Hospital, Mumbai. 1. Loukas M, Groat C, Khangura R, Owens DG, Anderson RH, The normal and abnormal anatomy of coronary arteries. Clin Anat 2009;114-28. 2. Williams P, Bannister LH, Berry MM, Collins P, Dyson M, Dussek JE, et al. Cardiovascular system, The arterial system. Glabella G, editor. Gray's Anatomy. The Anatomical Basis of Medicine and Surgery. 38 th ed. Edinburgh, London: Churchill Livingstone; 1995. p. 1505-10. 3. Bhimali S, Dixit D, Siddibhavi M, Shirole VS. A study of variations in coronary arterial system in cadaveric human heart. World J Sci Technol 2011;1:30-5. 4. Bergman RA, Afifi AK, Miyauchi R. Illustarted Encyclopaedia of Human Anatomic Variation, Coronary Arteries. p. 2-18. 5. Solanki P, Gerula C, Randhawa P, Benz M, Maher J, Haider B, et al. Right coronary artery anatomical variants: Where and how? J Invasive Cardiol 2010;22:103-6. 6. Simkoff WL, Murphy ES, Demots H, Khousaris, Abbruzzese P. Anomalous origin of right coronary artery from the left anterior descending; Angiographic diagnosis in a patient with coronary artery disease; Cathet Cardiovasc Diagn 1982;8:49-53. 7. Kini S, Bis KG, Weaver L. Normal and variant coronary arterial and venous anatomy on high-resolution CT angiography. AJR Am J Roentgenol 2007;188:1665-74. 8. Kimbiris D, Iskandrian AS, Segal BL, Bemis CE. Anomalous aortic origin of coronary arteries. Circulation 1978;58:606-15. 9. Cavalcanti JS, de Lucena Oliveira M, Pais e Melo AV Jr, Balaban G, de Andrade Oliveira CL, de Lucena Oliveira E. Anatomic variations of the coronary arteries. Arq Bras Cardiol 1995;65:489-92. 10. Waller BF, Schlant RC. Anatomy of Heart. Husst's The Heart. 8 th ed. p. 84-6. 11. Fox C, Davies MJ, Webb-Peploe MM. Length of main left coronary artery. Br Heart J 1973;35:796-8. 12. Gazetopoulos N, Ioannidis PJ, Marselos A, Kelekis D, Lolas C, Avgoustakis D. Length of main left coronary artery in relation to atherosclerosis of its branches. A coronary arteriographic study. Br Heart J 1976;38:180-5. 13. Mian FA, Malik SN, Ismail M, Khan IS, Kachlu AR, Rehman M, et al. Coronary artery dominance: What pattern exists in Pakistani population? Ann Pak Inst Med Sci 2011;7:3-5. 14. Reddy VJ, Lokanadham S. Coronary dominance in South Indian population, Int J Med Res Health Sci 2013;2. 15. Decker GA, duPlessis DJ. The heart and the great vessels. Lee Mcgregor's synopsis of surgical anatomy, 12 th ed, chapter 22. Dadar, Bombay, India: K.M. Vargheese Company; 1986. p. 280. 16. Sabnis AS. Morphological study of myocardial bridges. World Res J Cardiol 2013;1:4-6. 17. Schulte MA, Waller BF, Hull MT, Pless JE. 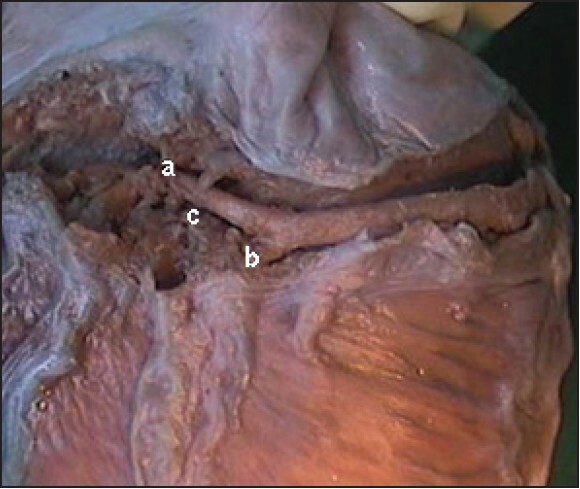 Origin of the left anterior descending coronary artery from the right sinus with intramyocardial tunnelling to the left side of heart via ventricular septum. 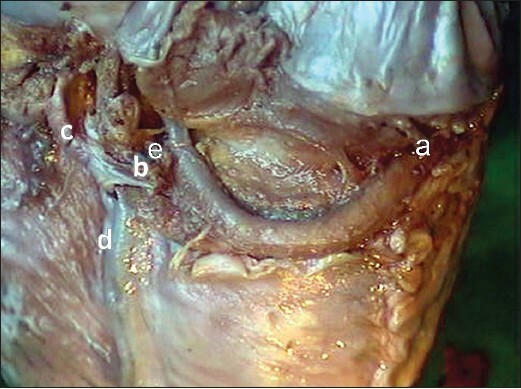 A case against clinical and morphological significance of myocardial bridging. Am Heart J 1985;110:229-501. 18. Polacek P, Kralove H. Relation of myocardial bridges and loops on the coronary arteries to coronary occulsions. Am Heart J 1961;61:44-52. 19. Waldman J. Division of Paediatric Cardiology, University New Mexico, 2211 Lomas Blvd NH, 87131-5311 Albuquerque, USA; The Annals of Thoracic Surgery; Invited Commentaries. 20. Johnson Maryl R. Cardiac Imaging. Clinical aspects of data acquisition in coronary angiography. A Companion to Braunwald's Heart Disease. Philadelphia: WB Saunders Company; 1991. p. 182. 21. Bandopadhyay M, Das P, Baral K, Chakraborty P. Morphological study of myocardial bridge on coronary arteries. Indian J Thorac Cardiovasc Surg 2010;26:193-7. 22. de melo Lima V Jr. Myocardial bridges and their relationship to the anterior interventriular branch of left coronary artery. Arq Bras Cardiol 79:219-22. 23. Ferreira AG Jr, Trotter SE, König B Jr, Décourt LV, Fox K, Olsen EG. Myocardial bridges: Morphological and functional aspects. Br Heart J. 1991;66:364-7. 24. Saltissi S, Webb-Peploe MM, Coltart DJ. Effect of variation in coronary artery anatomy on distribution of stenotic lesions. Br Heart J 1979;42:186-91.